The quest for the perfect pair of candy colored pumps is over! Say hello to the Sonya Punkie by newcomer Gigi Favela footwear. These pumps are Truly Outrageous! Conjures images of The Misfits from "Jem and The Holograms"; Madonna in "Desperately Seeking Susan" and the video vixens from the ZZ Top video "Legs," with the micro minis and pumps with fold-over ankle socks. Hotness. 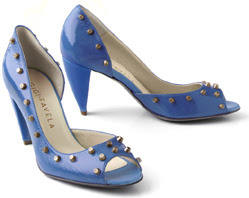 The bold metal rivets are a perfect compliment to the Italian patent leather, peep toes and cone heels. Prime squeal material fer sure!